Why You Must Watch This FREE ManWeaveUnit Fast IMPLEMENTATION Webinar. THIS IS FOR YOU whether you're new or a veteran to the barber beauty industry- in which case you'll leave with advanced skills, or if you've been a student of this industry for quite some time- you'll discover little hinges that swing BIG doors wide open in your business to let hidden profits pour in! Wondering how you can consume all the information you receive in the private ManWeaveUnit Online University and other materials in a way that will have the information sink in FAST, so you can implement it FAST, and GROW YOUR BUSINESS FAST! Feeling like a lost and lonely soldier doomed to do battle in the business jungle, alone without the tools and strategies you need to make YOUR business the DOMINANT business in your community or barber and styling business. And worse, you might still be thinking that your shop is different. That's the thinking of an AWOL barber and stylist soldier. At ManWeaveUnit we believe and have proven over and over again that we constantly EDUCATE, EMPOWER and ENLIGHTEN our members. Our sole mission is to provide you with proven and effective ManWeaveUnit information, strategies, resources and know how so you can Master the techniques effectively (for MAXIMUM PROFIT & GROWTH)- because after all, that;s the business you're in. This is about YOUR BUSINESS becoming the DOMINANT business in your community and in your business , shutting our your competition and putting in iron cage around your customers. How to find the HIDDEN GOLDMINE in your own town (there's a fortune to be made with just this bit of information alone). The Ultimate Man Weave Unit Blueprint course is designed to teach you how to create the most jaw-dropping men’s hair transformations. 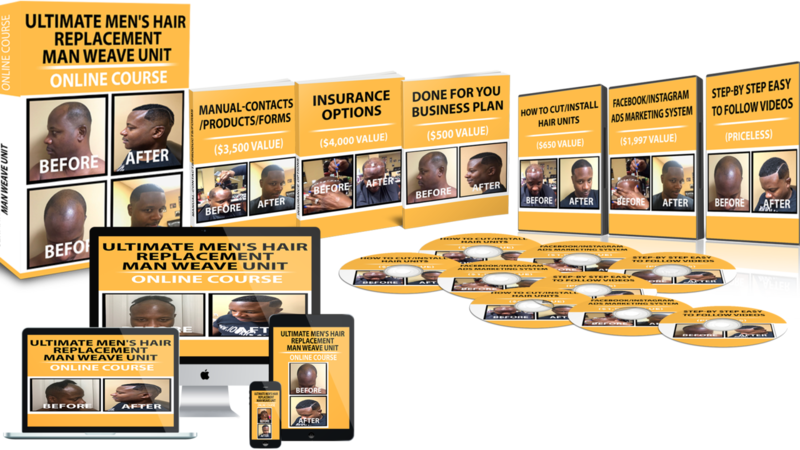 The Ultimate Man Weave Unit Blueprint course will help you to gain confidence in satisfying your customers/clients. The course is designed for any Barber or Stylist who would like to 10X their income and advance their skills in mastering the Man Weave Unit.